When we were planning a recent trip to Warwickshire I couldn't help myself but look to see if there was any gardens of interest in the area. Top of the list was Ryton Organic Gardens. A quick look at the website and I found not only was it obviously a fully organic garden but also one that specialized in fruit and vegetables. My search ended there and then. 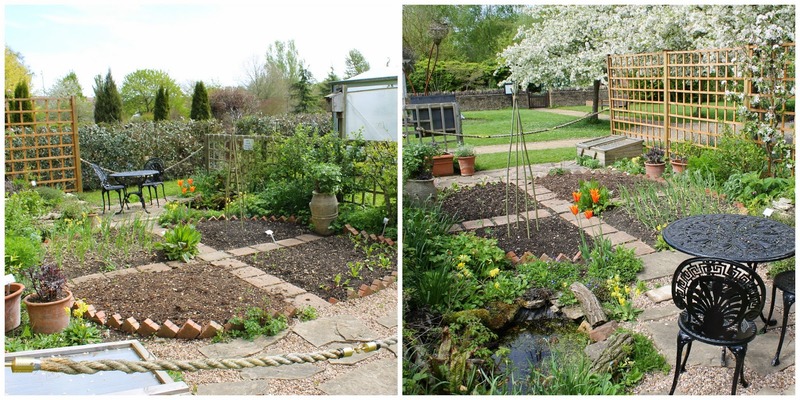 The Ryton Organic Garden is not just an organic garden but it is also the headquarters of the Garden Organic charity. Back in 1954 Lawrence Hills set up an organisation based on his belief of organic gardening and the benefits of comfrey as a natural fertiliser. He found a smallholding in Essex where he was able to set up a charity and experiment with different methods of organic gardening. It expanded through the 1960s and by 1975 the Heritage Seed Library was set up. In 1985 they moved to Ryton to set up a permanent base. As we visited at the weekend we entered through the vegetarian and vegan Fusca café. The first part of the garden you come to the Naturalistic Planting and Low Maintenance Landscape. 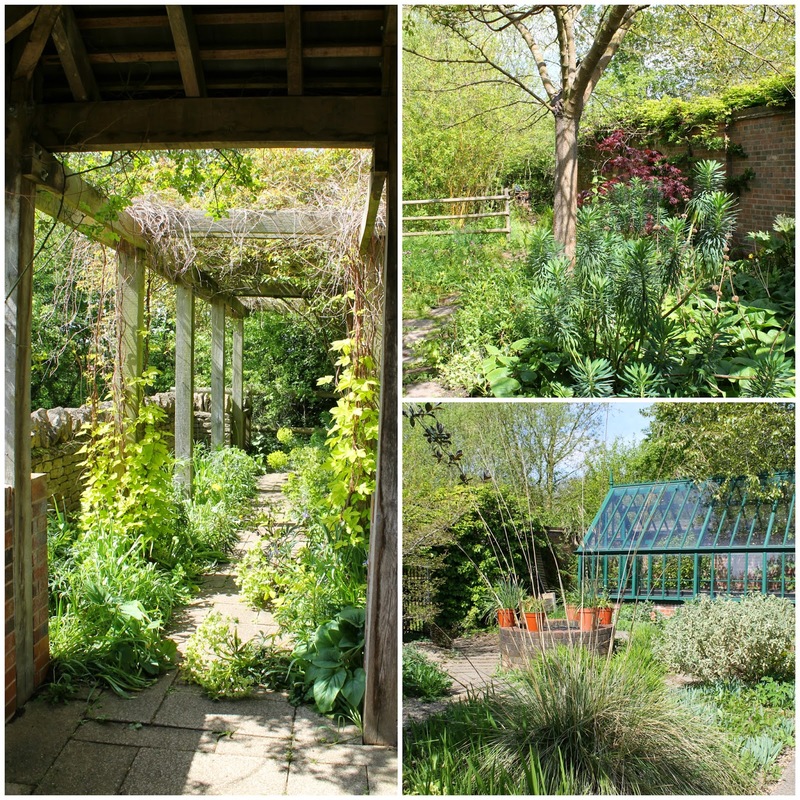 The idea is that many people are put off having gardens as they think they are too much work but this shows how you can let nature do its own thing. While we were there a very content robin was landing on different plants and bushes in search of food. The site at Ryton takes up about 10 acres but it is divided into different areas each with their own identity. It shows that if you have a plot of land whatever its size you can plant a sustainable and organic garden. The focus is on growing food such as in the Cooks Garden. Despite the brick paving the borders are filled with herbs from sage and fennel to different varieties of mint planted in sunken pots. Everything grown in this garden has some part of it which is edible. The amazing thing about this garden is that it's not very big and most people's domestic gardens are probably much bigger. Next to the Cooks Garden is the Growth Therapy Garden which leads onto the Memorial Garden. 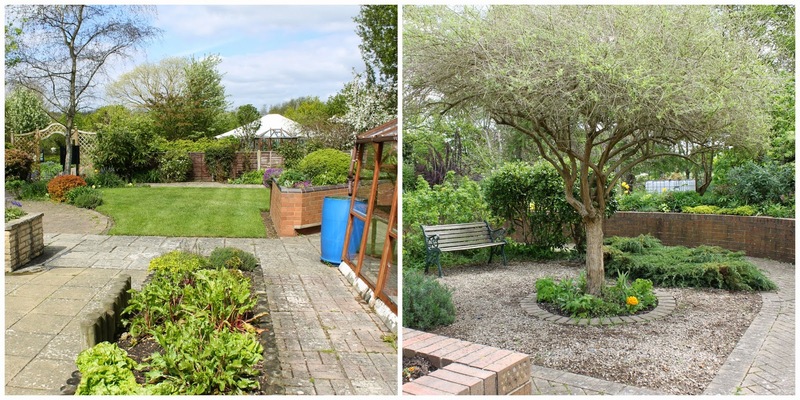 In recent years the health benefits of gardens and gardening have become well acknowledged but at Ryton they have been using horticultural activities as therapy for over 25 years. The raised beds of the Growth Therapy Garden continue into the Memorial Garden. This is dedicated to the founder of the Ryton Lawrence Hills and his wife Cherry. The raised beds enable people with physical and visual impairments the chance to feel and smell the plants. In the Apple Orchard different varieties of apples are showcased from bush trees to slim trees suitable for small spaces. Have you ever seen an apple blossom so pink? At the back of this apple circle are other fruit trees such as pears, plums, cherry and quince. The plots at Ryton are always being developed with old areas being changed to make way for new projects. In the former Bee Garden the National Heritage Vegetable Garden is starting to take shape. This will contain vegetables grown from seeds which are been preserved by the Heritage Seed Library. Fear not for the bees though as there are still plenty of plants and flowers for them in this section plus a bug hotel and water area. Almost seamlessly following on from the National Heritage Vegetable Garden is The Allotment Garden. As with all the other parts of the garden this is organic showing how people can grow food naturally. Trellises made from tree branches are in place ready for runner beans to race up. 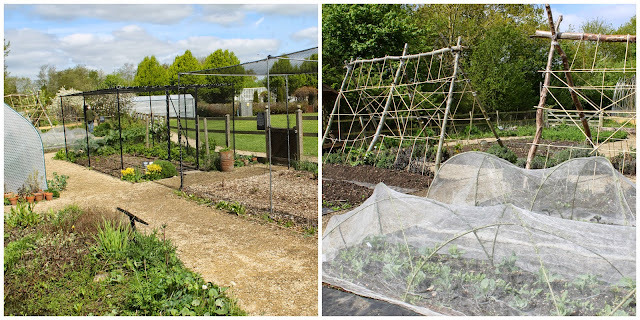 Fruit cages protect the raspberries from being eaten by birds. The principles of crop rotation are in place in order to minimise plant infection and disease. Onto the Elysia Biodynamic Garden. This garden was originally opened in 2007 and was the first biodynamic garden open to the public. At the heart of biodynamic gardening is that all life is interconnected no matter how big or small. The preparation of the compost is vital to the success of such gardening with plants such as dandelion, stinging nettles and chamomile key ingredients. In this garden everything has been planted in accordance with the lunar and celestial cycles. You may get sceptical about such methods but the size and abundance of fruit on the currant bushes speak for themselves. From this year it will be maintained by The Biodynamic Garden Society. Before his untimely death n 1996 Geoff Hamilton's last television programme was called Paradise Gardens. It is from this the inspiration is taken for the Paradise Garden at Ryton. Although Hamilton was perhaps best well known as the presenter of Gardeners' World he was also passionate about organic gardening and bringing its appeal to the masses. This tribute garden to Geoff Hamilton is divided into two sections – Town and Country but are still able to sit side by side with each other. In the Country section there is a flower meadow and wildlife pond. The Town garden features a pergola walk and a greenhouse full of cuttings. I haven't covered all the gardens at Ryton but the last one I'm featuring is my favourite known as the All Muck and Magic Garden. Like the Cooks Garden it is a small plot, in fact smaller. Many years ago I remember seeing in a book a herb wheel just like the one in the centre of this garden. It is constructed with house bricks and divided into individual sections which allows efficient crop rotation. This was originally designed for a Channel 4 programme to highlight the ability to be able to have an organic and sustainable garden in a small space. There is also room for a cold frame, composter, rockery and pond. After all your hard work you can admire it whilst taking tea on the table and chairs. The inspiration at Ryton is amazing. Whether you have enough land for an apple orchard or a handful of herbs there's something for everybody to take and implement in their own green space. I don't remember the show being on Channel 4 as it was 1988 but the garden has lasted very well. I like the sound of low maintenance garden inspiration! I love Ryton. The last time we were there I took my son who was then just three. My mum was with us which meant I could have a little wander on my own-got so much inspiration from there. Really useful and practical tips too. I still have a copy of Geoff Hamiltons's Organic Gardening, although I must own up to occasionally spraying. A beautiful garden. This is all an abundance of food for thought. I've wanted an allotment area in the garden since before we moved in and finally decided that next year will be the year to do this. It looks like a great place to get some ideas.I like the pergola area- looking overgrown. You had me at 'low maintenance'! I love how they help show how you don't need lots of time and effort to be able to enjoy and nurture a garden - often I come back from gardens feeling a tad inadequate and that as wonderful as what I have seen is, it's not really achievable for me. This is a real find! I'd love to look around to get inspiration and see how they are growing their fruit and vegetables. It all looks so interesting especially the biodynamic garden. Ryton is fabulous and so inspirational. I'd love to go back and revisit one day.